FF AdBlock Protection is the PUP that uses misleading techniques to prevent removal. Use Reimage to locate malicious components and get rid of them faster than with uninstall instructions. A full system scan blocks virus reappearance and prevents traffic to malicious domains. FF AdBlock Protection is another suspicious Mozilla Firefox extension that was detected at the beginning of 2018. 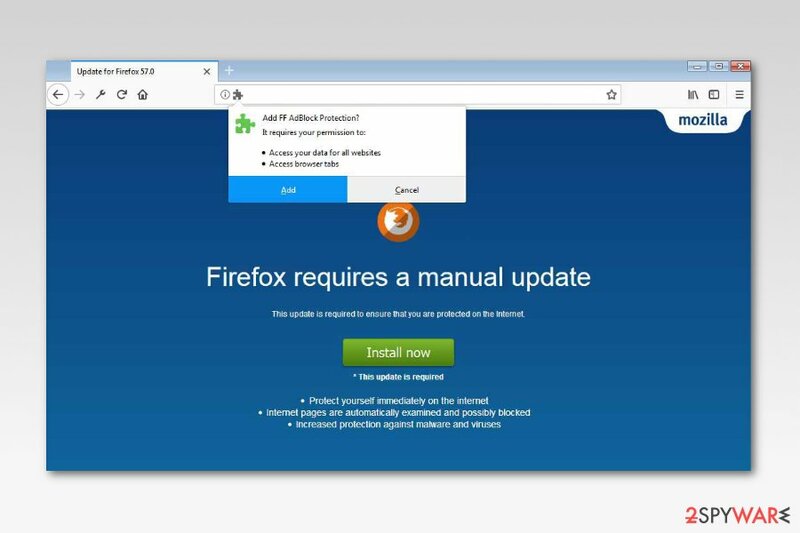 The add-on is actively being pushed with the help of adware programs which redirect users into a compromised website that urged install a manual Firefox update. Security specialists from NoVirus.uk warn Firefox users to be careful because these type of scams are extremely popular and aggressive. Thus, if you have been redirected to a website that asks to install FF AdBlock Protection, FF Search Informer, FF AntiVir Monitoring or similar extension, you have to leave this site immediately. However, the research has shown that the malicious website might be preventing users from closing the browser. If you cannot close this browser tab, you should kill Firefox processes in the Windows Task Manager. If these redirects continue, you should also use Reimage or another anti-malware software to check if adware was not installed on your device. The ad-supported program which is responsible for redirecting to FF AdBlock Protection scam website usually is installed together with free programs. Thus, the hijack is often unnoticed. However, soon users are bothered by redirects, ads and other suspicious activities on the affected web browser. Keep in mind that Firefox updates do not arrive in such form. Thus, you should not install any app or update offered by FF AdBlock Protection adware. The installation of this tool might end up with infiltration of spyware, malware or trojan horse. Hence, you might suffer from further computer-related problems. If redirects to this site repeats itself and you also noticed an increased amount of pop-ups while browsing the web, you should take care of your computer’s state. As we have mentioned already, it might be the sign of adware infection. Thus, FF AdBlock Protection removal is needed. 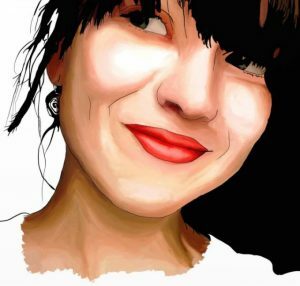 This suspicious application can be removed either manually or automatically, so you have to choose the method that suits your needs and skills. 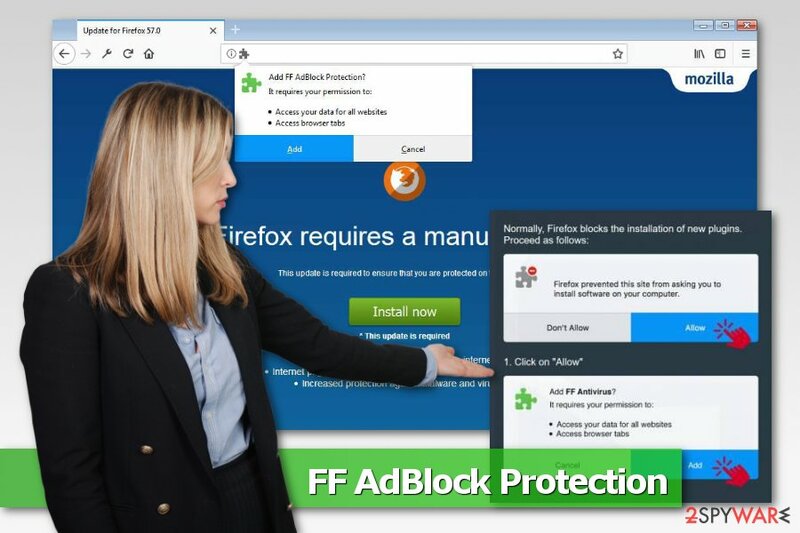 Anti-malware tools can quickly remove FF AdBlock Protection from the system, but if you are not willing to installing additional software, you should follow the manual removal guide below. FF AdBlock Protection is a fake Firefox add-on that is promoted with an adware program. FF AdBlock Protection redirect virus was spotted spreading in the same way as other potentially unwanted programs – bundled with freeware or shareware. Hence, if you have installed a free program using “Quick” or “Recommended” settings. You should always have in mind that these settings do not reveal additional components that might be included in the freeware package. Thus, you have to get used to “Advanced” or “Custom” installers and read notifications provided there attentively. If you see any programs, PC optimizers, browser add-on or similar entries offered to download, please remove the ticks next to them to avoid unwanted changes to the browser or computer. If you have accidentally installed this malicious Firefox add-on, you have to delete it from the extensions list immediately. Checking the list of browser add-ons is also needed if you are continuously being redirected to this corrupted site too. The guide below will give you detailed explanation how you can locate and eliminate all adware-related entries. Follow it carefully because if you overlook some entries or forget to reset the browser, FF AdBlock Protection removal wouldn’t be completed successfully. If you want to avoid failure and save your time, you should remove FF AdBlock Protection automatically with anti-malware software. After the scanning the system and letting the program to clean malicious components, you should still reset Mozilla Firefox. Here, look for FF AdBlock Protection or any other recently installed suspicious programs. Wait until you see Applications folder and look for FF AdBlock Protection or any other suspicious programs on it. Now right click on every of such entries and select Move to Trash. When in the new window, check Delete personal settings and select Reset again to complete FF AdBlock Protection removal. Once these steps are finished, FF AdBlock Protection should be removed from your Microsoft Edge browser. Here, select FF AdBlock Protection and other questionable plugins. Click Remove to delete these entries. Now you will see Reset Firefox to its default state message with Reset Firefox button. Click this button for several times and complete FF AdBlock Protection removal. Here, select FF AdBlock Protection and other malicious plugins and select trash icon to delete these entries. Click Reset to confirm this action and complete FF AdBlock Protection removal. Here, select Extensions and look for FF AdBlock Protection or other suspicious entries. Click on the Uninstall button to get rid each of them. Now you will see a detailed dialog window filled with reset options. All of those options are usually checked, but you can specify which of them you want to reset. Click the Reset button to complete FF AdBlock Protection removal process. ^ NoVirus. NoVirus. Latest cyber security and spyware news. ^ Larry Seltzer. Fake Firefox Update Page Pushes Malware. PCMag. Technology product reviews, news, prices and downloads . ^ Dan Price. 4 Malicious Browser Extensions That Help Hackers Target Their Victims. MakeUseOf. The guide in modern tech. This entry was posted on 2018-02-05 at 08:15 and is filed under Adware, Viruses. You can quickly scan the QR code with your mobile device and have FF AdBlock Protection manual removal instructions right in your pocket. How did you remove FF AdBlock Protection?